In this episode, an homage to Wacky Races. Because it's not like there's anything important like the imminent deletion of the world going on or anything. We got time for Muttley. Sometimes, you have to recognize when an episode is just trying to have some fun. This is a rare episode that is 100% pure, uninhibited filler. No spirits to collect or evolved forms to promote, just a wacky race that is best known for being an homage to Wacky Races. Because kids these days are all about decades-old Hanna-Barbera cartoons. The kids get dragged into this race, deal with the Dastardly/Muttley combo, catch an assload of trains falling from midair and eventually Takuya just up and launches his train across the finish line for the win. Can we really be too harsh on something this silly? Yes, of course we can. What a ridiculous question. This episode may be written for laughs but the series as a whole is still an adventure. Therefore, there are certain restrictions and limitations that prevent the main characters from being so strong that there's no drama or tension in their inevitable victory. While the episode seems like one of those silly, harmless outings that we just throw a C+ at and move on, it's hard not to notice that everybody except JP is ridiculously overleveled. We all bash Kazemon and Kumamon in this series for being weaklings that end up without a whole lot to do. 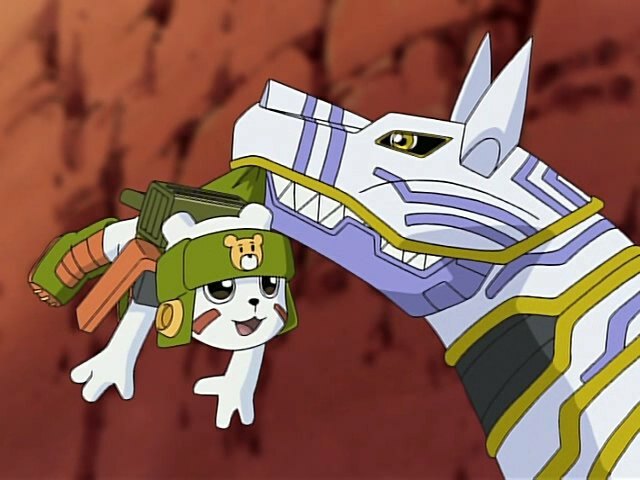 If this episode is to be believed (and it's not), these two are incredibly strong, versatile Digimon that would beat the stuffing out of any of Zero Two's Armor evolutions. After Muttley (there's some disagreement as to whether his name is Dogmon or Doggymon, so we're calling him Muttley) blows up the track and sends Trailmon Mole into a free fall, Kazemon flies into the chasm and catches the locomotive before lifting it back up to safety. Two episodes ago, Zoe couldn't even dream of Kazemon airlifting the team to the other island. Even if this episode isn't to be taken seriously, it's still hard not to spot that disconnection. Tommy, meanwhile, uses his ice-shifting ability to incredible effect here. Whether it's creating an ice bridge to help guide his Trailmon over the chasm or inexplicably finding a way to catch a falling Takuya without killing either either of them, we get some new moves out of Kumamon. He even catches a Trailmon of his own when Franken goes over the edge. Even if he's not as tough as the others, we're seeing a lot of neat stuff that Kumamon's capable of that doesn't get utilized often enough. You almost wish that Kumamon was one of the bad Legendary Warriors so we can better appreciate his full arsenal the way we saw Grumblemon's a million times. KendoGarurumon shows up both Kazemon and Kumamon by catching two trains, and Kumamon, at the same time. Generally it's pointless to get too bent out of shape when characters do physically unlikely things in filler episodes. It's almost always done for laughs in a situation best described as a farce. The real problem isn't that Kazemon and Kumamon ate their spinach today, it's that it's less about being funny and more about conveniently making sure nobody gets hurt. The powers that be are insistent that no matter how many Trailmon go off cliffs and no matter how inevitable it is, there will be no fiery explosions at the bottom of the chasm. Obviously they've never seen Back To The Future III, otherwise they'd realize that they're depriving us of the best part. The one cool thing about this episode is that it does put the unique personalities of each of the various Trailmon on full display. We've seen most of these guys before, but when they're all side by side we can see how different they all are, from the gruff Worm to the nebbish Mole to Kettle who may very well moonlight as a blues singer. My personal favorite was the easy-going Franken, who asked Koji “are the cliffs in your world as high as they are here?” as they were cascading off one. You know, they can run it into the ground, but as far as I'm concerned, the jokes about Bokomon pretending he's pregnant will never start being funny. So let's get this straight- the prize for winning an eating competition is free train tickets and the prize for winning a train race is food. Awfully convenient that both awards were for seven people/Digimon. Angemon sounds pretty much the same as he always has, but his dub voice is perfect for announcing the race. He almost sounds like Don Pardo during the introductions. 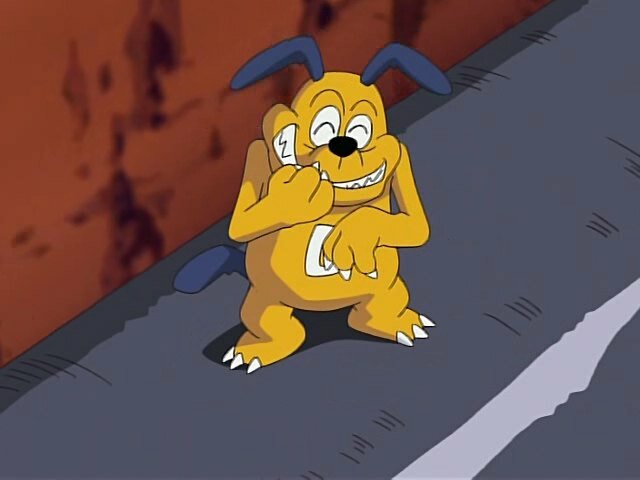 When Bokomon tries to wake up Neemon, Neemon mumbles “five more minutes,” a line used very frequently in Tamers, often in very inappropriate places. While Zoe and Tommy get to flex their pretend muscles, you kinda feel bad for JP, who was eliminated early and seemed to spirit evolve just for the hell of it. This is the second time a Trailmon successfully ramps a gap. Trains aren't supposed to work like that. When Takuya and Worm rolled across the finish line, the others looked positively disgusted about the result for some reason. You'd think they'd be happier: it wasn't his fault they got dragged into it (that would be Zoe) and he at least salvaged a victory (and thus food) for them all. If we're praising the Trailmon, we also have to praise Dave Wittenberg for voicing every single one of them. Yeah, that's impressive. Time to be nit-picky! Angemon wasn't in the episode., that was Piddomon. Yay for giving screen-times to re-colors! Still have a while to go till Psychemon is a major villian. Of course no one cares about this fact so I think you are ok. While here, I agree this filler was so boring! At least some later filler in Frontier were surprisingly amusing. I was also caught really off-guard by Kazemon lifting a freaken train! I could see this goofy episode working as a Xros Wars filler but it felt just a tad bit too out-of-place here. Not by much though given other goofy stuff in Frontier. Think just a side-effect of coming from the ultra-serious Tamers that you expect the next season to not dip this silly. Pidomon's race announcement (especially the way he yells "OUT OF THE RACE!") and the Trailmon are the only things I enjoyed in this episode. You nailed all the other problems, but neglected to mention that the last two main characters racing were of course Takuya and Koji, with Takuya being the winner. Yawn. I think the thing that undermines this episode most is the fact that it's clearly shoehorned into a season that's about legendary warriors fighting each other. About halfway through the episode, they just can''t avoid a fight scene, and the race becomes simply a context. My personal favourite Trailmon was Worm. It's like the guy has a line for every occasion. TAKUYA: "So what do we do now?" WORM: "You mean besides dig me out of this hole?" Yeah,this was a weird episode.Luckly,I really like the trailmon and I think their design and personality/voices are very entertaining,so I was able to at least tolerate the episode,and enjoy it somewhat.....And At least it leads into the next episode nicely. Franken is definitely the best Trailmon, not going to lie. I have a special place in my heart for Angler, but Franken's attitude is perfect for the combo with Koji, and kind of refreshing.